Maneuvering a corner. The Charioteer is the embodiment of goals and action, being in charge of oneself and others, knowing where you're going and how to get there. 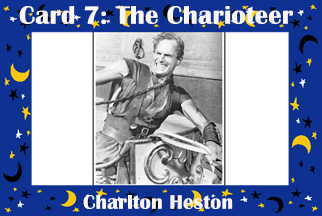 Whether Moses, Ben-Hur, El Cid or one of those 1960's science fiction heroes, Charlton Heston was riding ahead of the pack, getting stuff done.